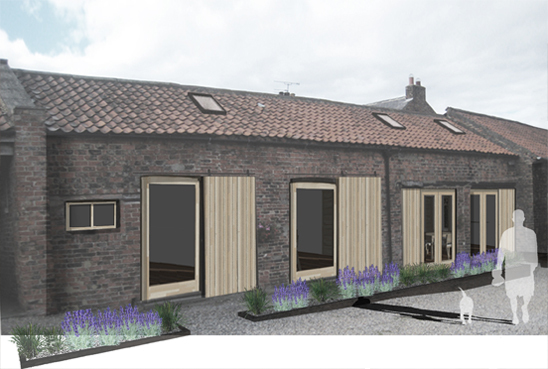 Our clients asked us to look at the possibility of converting an old stable block, across the courtyard from their house, into a self sufficient annex. The building is located in the village of tockwith near York, and we were faced with the planning constraints associated with the conversion of agricultural buildings within a conservation area. The intention was to sympathetically restore and convert the stable block to form a 1 bed self-contained annes to the main house with a gym/store to one end. Internally the design created an open plan kitchen and living space, with an enclosed bedroom suite. We aimed to respect the scale and form of the existing, with a modern reinterpretation of the traditional farm building, reusing existing materials with contemporary detailing. Existing doors and bricked up openings are replaced with large areas of glazing to bring light into the space. Agricultural sliding shutters are reinstated to close up the building when not in use.